Bell's superior contrac meal bait formulation is ideal to use if there is the possibility that rodents may transport the bait you use to sensitive areas near food, children or pets. Meal baits, while they are affected more by weather than alternatives, contain food-grade ingredients, seed and grain to be specific, which give rodents a variety of texture AND flavor which they love! Contrac Meal baits are available in a case of 120, slender (1.5 oz) place packs that keep bait fresh and free from dirt and contaminants, OR loose, in a 25Lb Pail. Would you like to see the Contrac Meal Bait Label? 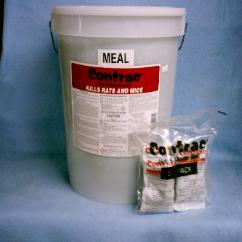 How about the Contrac Meal Bait MSDS sheet?